Effect as perceived by the audience: The performer gives a single envelope containing a single playing card as a prediction to a member of the audience. Then another random member of the audience is asked to freely name any playing card. Any one from among 52 cards which the spectator does. The performer's prediction is then proved to be correct, that too in a stunning manner. Presentation Options: Several interesting presentational approaches are described, one of which deals with the losing participant giving a kiss to the performer. After handing over the prediction envelope to the audience member the performer never ever touches the envelope except at the end to simply take out the predicted card. Now consider the following for what is NOT the method. The envelope is ungimmicked and there is really only one playing card inside it. No wallet is needed to perform this. No sleights. No pre show. No stooges. No dual reality or instant stooging. No equivoque. No forcing. No math. No verbal jugglery. Nothing written down. No peeks, no impressions, no tearing. No other playing cards are used except the one in the envelope. No threads, no electronics, no dinosaurs and no rocket science. The method is almost impromptu and completely self working and easy to perform. You can start performing it right after reading the instructions, although perfecting your presentation is always a good thing. You will surely fall in love with this principle and will start having your own ideas for using this in many other ways. Those who know Kolossal Killer by Kenton Knepper will really appreciate this innovation. Here the possibilities are much higher. And there is an apparently delicious false climax where the performer initially seems to miss closely. But finally it turns into a stunning climax where everything comes good in a most unexpected manner. As a bonus, a very cool version of using this principle to predict a participant's year of birth is included. This is designed to work for participants aged right from 5 years up to 77 years! 1st edition 2016, 19 pages. This is another GREAT effect by the UNKNOWN MENTALIST. I like the Ouija Board routine with the playing cards and also the number routine. In the playing card effect I printed the playing card grid on one side and the Ouija Board on the other on a 5 x 7 setting on the computer. I also made my prediction on card stock on a 5 x 7 setting. I plan on laminating both the grid and the prediction. This way I can just have the spectator look at the Ouija side until I have them turn to the grid side to find their card. This way I can use the props for a long time until I make another set up. I simply printed and will also print the number grid and also the prediction 5 x 7 and laminate them also. Sometimes it takes me a while to think the effect over in my mind as I'm familiar with the original KK effect but I believe this effect will be well worth it. I'm still pondering over the second KK effect and will definitely buy the last one. The core method here is a brilliant advancement over the Kolossal Killer idea of Kenton Knepper. 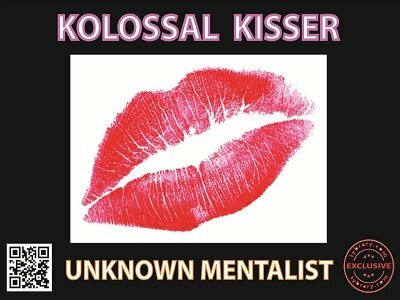 If you like Kolossal Killer method, you will like this too. If you do not like Killer, then you will definitely like this a lot. I believe, it is conventional thinking like this that truly pushes our art to new heights. The ouija board presentation coupled with the business card version will be the one I will be performing. In my opinion is is a very powerful combo. The biggest take away for me, unlike in Kenton's Killer, you do not need a wallet - just a single mini envelope in your pocket is all you carry. Further, applying this unique principle to year of birth theme given in the bonus routine is simply fantastic. The pseudo climax where you apparently miss followed by the actual climax creates a stunning impact. For me this was an extraordinary buy. No wonder this is topping the hotlist right now.